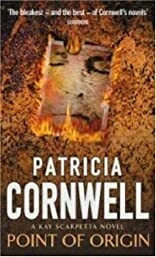 POINT OF ORIGIN was written by Patricia Cornwell. POINT OF ORIGIN was published by New York: Putnam's Sons (1998). Publisher New York: Putnam's Sons (1998). About Patricia Cornwell (Author) : Patricia Cornwell is a published author. Some of the published credits of Patricia Cornwell include Cause of Death, Point of Origin, Black Notice.